This low-carb chocolate cake is so rich and gorgeous, no one will ever believe it’s sugar-free and gluten-free. Lots of chocolate, butter and nuts come together to create a wonderfully indulgent dessert. 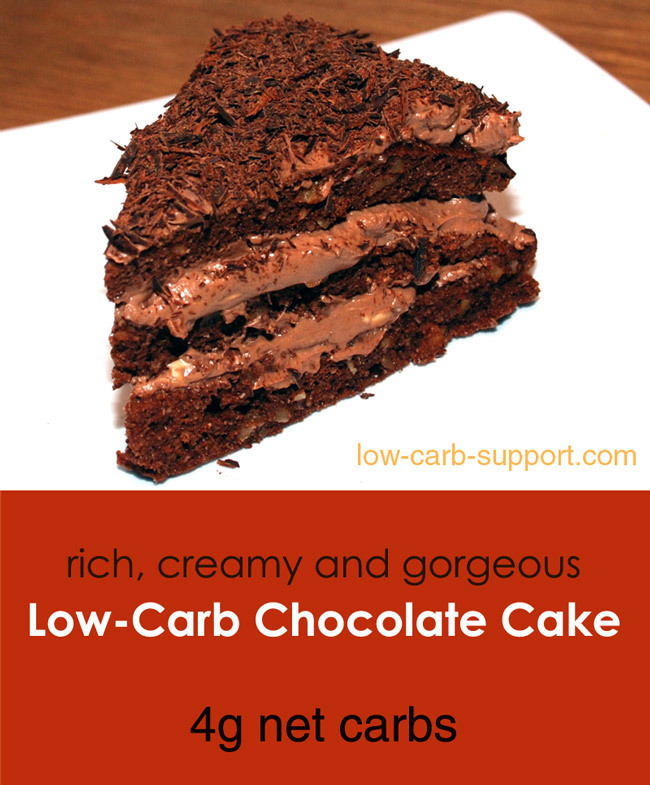 With only 4g net carbs per slice, it is the perfect birthday cake for any low-carb dieter! The cake is made from almond flour, chopped walnuts, and sugar-free chocolate. I used Truvia as a sugar substitute. There are two separate parts to the recipe – the cake itself, which we will cut into two or three layers, and rich chocolate ganache filling. You can also decorate with cocoa powder or chocolate shavings to make it look even prettier. 1 tbsp corresponds to 15 ml of liquid, 1 tsp to 5 ml. Mix dry ingredients – almond flour, chopped walnuts, half the cocoa powder (2 tbsp), half of Truvia (2 tbsp), baking powder and salt. Whisk the eggs lightly, add and mix in 1 tsp vanilla extract. Add whisked eggs to the flour mixture and blend well. Cooking time will depend on the size of your tin (and let’s face it, every oven is different). When cooked, the surface should be firm and springy. Mine took about 20 minutes. Cool completely before assembling the cake. Mix softened butter with cream cheese, double cream and 1 tsp vanilla extract. Add the other half of cocoa powder (2 tbsp), Truvia (2 tbsp) and cinnamon, blend well. Cut into cooled cake horizontally into slices. Depending on the size and shape of your tin, and on how much it raises, you should manage at least two slices, and possibly three. Assemble your cake, spreading ganache between the layers and on top. Decorated with chocolate shavings or dust with cocoa powder. Hi. I made this tonight and followed it exactly. The cake didn’t rise and was dry and dense. I did use the baking powder. It is new and so is the gluten free powder. The cake didnt look at all like the picture. Is it possible to use gluten free flour for this cake? I made this cake since it’s my aunt’s birthday and she is on keto. Haven’t eaten it yet but it appears to be in the dry side, sadly. I made two: one with half recipe and another with whole recipe. The half one I didn’t blend it, just mixed with a whisk and when baked it is a bit grainy-looking. The bigger one I decided to blend it with an immersion blender and I added about half cup of almond milk to the batter so it was thinner, and now it’s done, it looks smoother. Still haven’t tasted, though. They didn’t rise much but it can be my tins size, don’t blame it on the recipe. For the filling I made x1.5 recipe and I found the cream cheese was too prominent so I added about 100g sugar free dark chocolate + 150ml heavy cream (melted in the microwave). Thanks Mireia. I hope it tasted ok? I would like to know the grams of fiber in the whole cake. Being a diabetic, type 2 – I count total carbs. And as you know, in order to get net-carbs, you need to subtract the fiber from the total carb count. So you should already have that information. I doubled all the ingredients to make a large cake but modified the ingredients slightly. Used 8 eggs rather than 10 which would have been double and used some butter. Also sweetened from a few different sources which I find adds depth. Quite new to baking but my risks usually seem to pay off. It’s currently baking so will let you know how I got on later. It’s for my birthday hehe. Best of luck with your cake experiment – I really hope it turns out well. It would be great if you could post an update later and let us know how it went. How’d urs turn out? My first try is dry..I used almond & coconut flour. The batter was like a dough. Could be sweeter imo. I made chocolate cream cheese buttercream …it is delicious. I went rogue and added a lot more truvia.. creamed the heck out of it and thinned it with heavy cream…vanilla..
Coconut flour GUZZLES moisture due to its very high fiber content – much more so than almond flour. So if you sub coconut flour for almond flour, you need to add more moisture to the recipe, otherwise it will inevitably turn out dry. Best of luck with your diet! The amount of almond flour does not show up on this recipe. It’s listed as ground almonds. I made this and the cake does come out really dry. When making the ganache i found it tasted to much like cream cheese so I added some more truvia and some heavy whipping cream. Since the cake was so dry and I am not very good at cutting things in half i crumbled the cake into the ganache and mixed it together. Seems to have helped a lot with the dryness of the cake. I followed this recipe exactly and it was DELICIOUS! made it for my moms birthday and everyone loved it! I will definitely be keeping this recipe for future use! Thank you for sharing!!! Thank you! I am so glad it turned our well 🙂 And Happy Birthday to your Mom! I’ve not used almond flour or trivia before so was a little worried at how it would turn out however I followed your instructions to the letter (although I did reduce cooking time to15mins) and it was absolutely perfect although a little flat?? I did manage to slice it in half but was sad at its lack of rise. When you say lightly whisk eggs did you use an electric mixer? I only used a hand whisk but perhaps if I got more air into the egg it would rise? 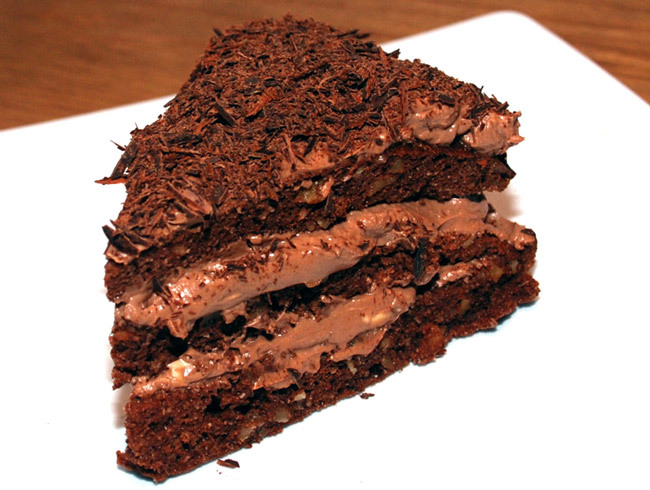 Thank you so much for your post, it’s the best sugar and flour free cake I have tasted so far!! – It’s your recipe, not my skill so I’m not bragging Sooooo pleased with it!! Hi Rachel, thanks so much for sharing your feedback! I am glad the cake turned out ok. I am sorry it ended up a bit flat. The main contributor to the rising process is baking powder. Did you use 1 full tsp? Sometimes baking powder loses potency if stored for a long time. Could this have been a factor? Do you think pecans rather than walnuts would be too much of a difference in taste? I went ahead and made this as is. It is good but I would call it more of a nut bread with a cream cheese spread. Hi Cate, sorry I didn’t reply sooner. I am glad it turned out ok. Was the cream cheese taste very obvious? Mine usually turns out quite creamy, and tastes like a cake filling. Did you make any other substitutions except pecans? Hey! I see in the directions it says to mix all dry ingredients including baking powder but baking powder is not on the ingredient list! How much do I put in? Thank you! OMG, you are right – I am so sorry! I have recently updated some hyperlinks in the recipe, and accidentally deleted the baking powder from the list – oops! Thank you so much for alerting me. I have added it back to the list now. Oh dear! I ended up adding vanilla almond milk 3/4 cup maybe a cup (I eyed the consistancy of a cake like batter look) as I saw all the comments of how dry they said it came out. I think this made it softer and more cake like. The chocolate butter cream cheese frosting was what gave it that extra bit of sweetness I needed especially since its that time of the month I crave more chocolate (not easy on a low carb plan). I then heated up some dark chocolate chips and sprinkled it on top….I wish I could post the picture…it looks yummy!!! It tastes pretty good too. Don’t get me wrong it doesn’t taste like the sugary goodness of its cousin…the real deal but I don’t feel guilty with 4 grams net carbs (I added them up and that’s about right, maybe just a little less). Plus its very filling as its a little dense but that means I ate less carbs and satisfied my sweet chocolate craving…score!!! Brilliant, thanks for sharing Shannon. Almond flour can really vary in dryness, I think I might need to add some comments or maybe even a video to demonstrate what to aim for. Can almond meal be used instead of almond flour? I’ve been to the local health food store and the grocery store and both are out of stock. Would anything need to be altered if almond meal was used? Hi Hayley, yes, almond meal should be fine. It’s pretty much the same idea – almonds are just not ground as finely as almond flour would be. But that shouldn’t be a problem. It also has a bit more moisture, but you don’t need to add anything extra. I hope your cake turns out well! Please let us know how it goes. I just made this cake and it is so dry! I added a cup of milk and 1/3 cup of oil to the batter and it was still like pouring sand into the pan. even so the cake came out very dry (I choked/ coughed when I took a bite) the icing was good though. Hi Heather, sorry to hear it didn’t turn out well. Almond flour can vary in dryness, depending how long it is stored and how well it’s sealed. So if it’s very dry, it might need more moisture. Apologies but it’s very hard to predict all the variance in ingredients when putting together a recipe. I made this recipe in 2 six inch cake pans. Iced entire cake. Cut…I have pictures but don’t see how to add them. I think my almond flour was a little too dry so I added a couple T of heavy cream to batter. Hubby is excited to try this tonight. This recipe sounds wonderful! I’m wondering if you’ve ever made this into cupcakes and if the baking time would vary? Thanks! Hi Katie, I haven’t tried it but I am sure it would work. I think the baking time would be about the same. Perfect, thanks for letting us know! Hello, I was very excited to try this recipe today after finally having all the ingredients. After everything was said and done, my cake was not very good. It didnt taste like cake. I kept thinking i had to have done something wrong, but as i looked at the ingredients again, i did it right. My cake also didnt look as dark as the one in your picture. Hoping i can try again, but scared to go through so much almond flour. Thank you. Sugar-free options are wonderful to come by but I found the almond flour to be too expensive. Can I substitute the almond flour with regular flour or another less expensive flour and the recipe still work? I am only need it to be sugar-free, the carbs are alright. Thank you for your input. Hi Kelly, unfortunately, nut-based flours are very different to regular flours (no gluten, more moisture, a lot more fat), so the whole chemistry of baking process is completely different. So I don’t think a straight substitution to standard flour would work. I suggest looking for a traditional chocolate cake recipe, and then just substituting sweetener such as erythritol instead of sugar. You might still need to experiment but I think that approach would be more likely to succeed. Sorry! I’m not sure, but is it supposed to be dry looking? I might just be doing this wrong cause I’m sleepy too. Please help! Hi Erika, sorry I didn’t catch this on the day. Yes, the mixture tends to be more solid compared to traditional wheat-flour based cake mixes. I hope your cake turned out ok? Please let us know. Hi Havilah, thank you so much for taking the time to leave the comment, and for being so positive! I am so pleased the recipe worked well for you 🙂 Best of luck with your diet! I am making this cake for the second time because it was a major hit the first time. The only thing I am doing different though is using a chocolate ganache for the icing with fresh berries for the decoration. Thanks so much for posting this delicious recipe .. Joy must have done something wrong bc there is no way this cake, when done correctly, can taste bad. We are slowly cutting sugar and gluten from our diet and I love finding recipes like this then wowing my friends and family when they hear the ingredients. 🙂 Thanks so much. I just made this and it tastes horrible. Actually, it is INEDIBLE. The cake itself tastes like dry, grainy bread, bitter and sour. The icing is even worse. Wayyyy too salty. I imagine it would be good on a bagel, in microscopic amounts. You should feel bad for posting a recipe for something so terrible tasting. You just make people waste food. Hi Joy, I am so sorry to hear the cake came out so badly. Yours was the most negative comment I ever got about anything! It is terrible that you wasted food and I understand that you would feel angry as a result. The only thing I can say is that something must have gone wrong. I have made the cake myself many times, and I had many positive comments about it from other people who tried making it, when I shared it on social networks and on reddit. Did you make any substitutions to the ingredients listed? I am not sure why would it taste salty – did you use by any chance use salted butter? What brand of cream cheese did you use? Perhaps you should think twice before you speak. I’ve read a lot of food reviews and yours is by far, the most insulting. And I don’t think you should blame the other person for a recipe that failed you. After all, you’re the one who decided to try the recipe. So you knew in the beginning, you might love it or hate it. You wasted the food Joy, you. Because even though you had a recipe, you were the one who made it. Thank you so much for your comment 🙂 It is always hard for a recipe creator to predict exactly how the recipe will turn out for other people. There are so many variables – different brands of ingredients, different ovens, and yes, the cook’s skill level matters too. Thankfully, most reviews I get are positive but occasionally someone might have a problem. But indeed, this was the worst review I ever got. Thank you again for your support – it’s much appreciated! I can’t wait to try ours. Made it for my husband’s birthday today. So far the frosting was awesome. I used unsalted butter and it was amazing with my taste test. I did accidently burn the bottom a tiny bit. I just waiting until it was completely cool and used a knife and sliced of the burned part. I must say I even tasted the burnt part and thought it was good! Even though it was burnt. I liked most about the recipe was it was easy to follow and called for “normal” stuff. Thank you for the post. Well the cake was a hit with everyone!!! Very excited we found a good chocolate cake recipe!!! Amazing! Thank you so much for your feedback! I am glad it turned out so well 🙂 Thank you! Too salty? Did you use the right butter? It does say unsalted. Going by other reviews, I’m thinking you might have used different ingredients rather than follow the recipe. Perhaps you should try again. Hi Gary, thanks for your comment. To clarify, I was not talking about side effects of Splenda, but its suitability for low-carb dieters who diet in order to lose weight. I don’t know much about specifics of dieting for people with diabetes and I don’t presume to give any advice or recommendation to diabetics (this is part of my website disclaimer). Granulated Splenda is a mixture of dextrose, sucralose and maltodextrin. I agree that sucralose is a completely safe sweetener that will not affect your blood sugar at all. However, maltodextrin is a different story. It is a carbohydrate which is easily digested. While its effect may be negligible when using a small portion of Splenda in tea or coffee, you would use much larger quantities for baking, and so overall amount of net carbs may be too high if you are on a low-carb diet. Many low-carb diet authors caution against maltodextrin for this reason. My recommendation is therefore to use erythritol-based granulated sweeteners for baking instead of Splenda, if you are on a low-carb diet for weight loss. I was wondering if you use splender ( maltodetrin, sucralose) how much of it will you need for this recipe? Hi Charlotte, I think Splenda is a little bit less sweet than Truvia, so I would use 3 tbsp of Splenda instead of 2 tbsp of Truvia. You can see conversion charts for both brands vs sugar here: Splenda http://www.splenda.com/cooking-baking/conversion-charts and Truvia http://truvia.com/recipes/conversion_chart. If you are on a low-carb diet, just a word of caution about maltodextrin, as it does affect your blood sugar so it’s best to avoid it if you can. Really I had no idea that splenda can affect your blood sugar I been using it now for years I thought that it wouldn’t affect the blood sugar I guess I will switch to Truvia now then. As a type 11 agent orange diabetic, I spend a great deal of time carb counting and doing research on what foods have what carb count. I have checked with the American Diabetic Society, Diabetis Magazine research, my personal physician, and the Veterans Administration. Every bit of research we can find shows that there is no short or long term effects of using spenda. We would certainly like to know where you got this research so that I can feel comfortable passing it on to my fellow vets. Could you please respond either on this website or to my email. If we are wrong we certainly need to know about it. I just added the icing ingredients too! I’m thinking of doubling it to fix the problem. Does doubling work well with this recipe? OMG! I am so sorry. I have now updated the page, separating the list of ingredients into two groups – for the cake and for the icing. Amber – I hope it wasn’t too disastrous! Apologies again. Hi Lori, you are right, it is a bit confusing, apologies. I used a round 9-inch (23cm) cake tin to bake a single cake layer. I then cut it into three and assembled on top of each other with filling, and then sliced it again. My main concern at that stage was to create a photogenic-looking slice of cake, which I why I used three. It would be easier to just use two. Using the amounts of ingredients listed above, you end up with about 900g total of cake and icing mixture (about 2 lbs). The total stats for the whole thing are: 3500cal, 36g net carbs, 117g protein, 315g fat. You can assemble them in any way that is convenient, and then calculate amounts per slice depending on how many slices you end up with. Please bear in mind that this cake is very filling, so my suggested serving size – 1/8 of the overall amount – is a satisfying portion. I hope this makes it a bit clearer, please let me know if you have any further questions. Hi Rob, thank so much for your comment, I am very glad you liked the cake. I double checked the macro counts and I think they are correct. The overall weight of the mixture was 900g, working out as 112.5g per slice (all those nuts making it quite dense!) – assuming the cake is cut into 8 pieces. So that’s why the macros are more for one slice than for the whole cake. I hope this makes sense? Or is there something I am missing? This cake looks beautiful! I bought and extra deep round cake pan last year that should do justice to this recipe. I look forward to trying it next time I allow myself a sweet treat. Great, thank you, please let me know how it goes. 3 eggs might probably be enough. Thanks. I find that the amount of moisture required really depends on the flour you are using. There can be some variance with almond flour – across different brands, depending on how finely it is ground and also on its age, as it can dry out a bit over time. So if you feel that 3 eggs might work better with the type/brand of flour you normally use, this may well be the case.